Arriving in Bordeaux yesterday was a moment of personal happiness for me. I have eagerly anticipated this assignment for so long and to land with all my camera gear (Nikon D810, D750, DJI Mavik Pro, GoPro5, lighting, tripods, batteries), and not have anything missing was also a blessing given the importance of this trip. We were definitely tired, having flown from Calgary to Amsterdam, and the outbound flight had been delayed arriving from Amsterdam. We had a 4-5 hour layover in Schipol airport, and i can attest that there are worse airports than Amsterdam’s lively hub to be laid over at. We walked to our next gate and then enjoyed a small meal and some coffee as we tried to stay alert before our next connection. We were met at Bordeaux by a driver from the Chateaux who warned us he spoke very little English. I brought out my app and managed to spark up a conversation, learning he was from Morocco originally, and that he felt Chateaux Pontet-Canet was one of the top 3 wineries in Bordeaux for being the most beautiful and prestigious. He drove us carefully for almost an hour to the town of Pauillac in the Medoc region. We relaxed comfortably in the back seat taking in the scenery and chatting comfortably with our driver. Our first few hours on the Chateaux were an experience in themselves. 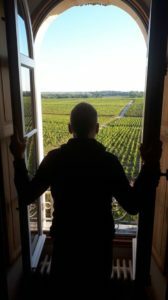 We learned we would be staying in a private apartment on the top of the Chateaux, overlooking the hectares of grapes and truly a magical view. We got settled and learned we would be dining regularly with the Portuguese pickers and workers here for harvest in a grand dining hall. As we made our way tentatively in, we sat at a table one of the servers gestured at, where jugs of water and wine, and baguettes waited for the hungry crowd spilling in. Bowls of hot soup that smelled and tasted delicious were placed in front of us, and a simple meal of vegetables, rice and sausage were brought out and promptly devoured by the workers we sat with. Afterwards, they walked around distributing an orange to each of us that was very fresh and appreciated . It reminded me of my time spent living in Italy where, without fail, a piece of fruit completed every meal no matter who was dining. The food was hearty, simple and tasty and we ate with enthusiasm as we talked in low voices to each other, drowned out by the loud din of more than 100 people eating around us. I love that we will be spending a lot of time with the pickers and workers themselves, and I’ve already identified a few who’s portraits I’d love to take during our time here. The ages run from quite young in their 20s to more elder women and men, and Justine informed us that they are the same workers every year who come over from nearby Portugal to perform this harvest. We felt embarassed at our lack of French but it is also interesting to note how many words you remember from growing up in a bilingual country all our lives. At least we’ll practice! After dinner the workers spilled out into the courtyard where a very old well is situated in the center. Standing around smoking, talking, texting on their phones and relaxing, we spent a few moments and then made our way back to the apartment where we collapsed shortly thereafter into an exhausted, restful sleep. We slept soundly until around 3:30am, when we both awoke for an hour or so and then fell back asleep until waking up at 8 to meet our host for a tour of this incredible property. Thanks for following our adventure- stay tuned for Day 2!